Artificial Intelligence is a topic of continuous expansion and exploration. It has been above the folds of the Google or apple play store. 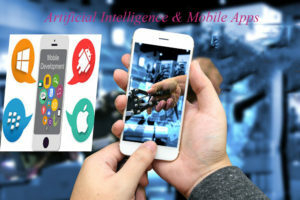 2017 has been the year that flourished to integrate the AI to the mobile app world. Actually Artificial Intelligence or AI is the machine learning, computer learning intelligence to perform the task that otherwise has to be performed by human thinking and intelligence. It will perform the tasks using a combined approach of machine learning, knowledge management, machine vision and natural language processing. It shoes the intelligent computing even for the new data. At the initial stages when android, apple & other mobile phones started getting attention. It was always a challenge for how to navigate the apps in a crowd of thousands of apps. The power of voice search proved handy for that. Internet of Things (IoT) is really awesome and the integration of voice interface has a lot impact on it .It is easier to command for the things around it. There are always new upcoming revolutions for android &iPhone apps development.Mentobile Technology is the preferred android & mobile app development company that focus on new emerging trends of android & iPhone apps. There are so many apps to make the life of the people easier and improve the user experience. The Starbucks Barista is such a sort of app. You have to tell the app what you want; the app places the order for what you want. Integration of artificial intelligence into the mobile apps makes it more compatible as smart phones know everything about their user. The devices can give the location based solution for every query. The features will compute the behavioural aspects of the client and provide them what they want. In the era of the modern world, the people have options for more apps than what they may surf. Therefore, developer should always try to build up intuitive and innovative apps. Artificial Intelligence and Internet of Things are the two things that are really going to rule the features of today’s mobile industry.